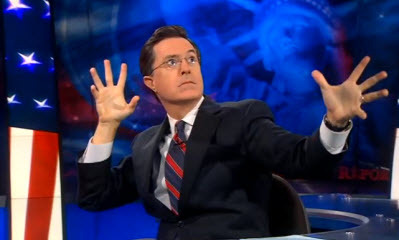 It’s incredibly odd to think that there’s just about a week left of The Colbert Report. It’s extremely weird to think that it won’t be around anymore. This is because the show premiered in 2005. I don’t entirely remember a world without it. Stephen Colbert is a genius while his character is not. It’s really, really easy to forget that this is a character portrayed on screen. That speaks to how strong of an actor Colbert is. He makes it impossible to realize that he isn’t the crazy person you see every week. Instead he is a smart, wonderful guy who is a genuine joy to watch. It’s both exciting to get to see this Colbert take over for David Letterman on the Late Show. It’s also sad to think that we will no longer have the Colbert character – a retirement confirmed by Colbert almost immediately upon the announcement he’d be moving to CBS. I could like to videos of The Colbert Report long enough that it would take the rest of the year. Instead I want to link to a video that shows flashes of both sides of his persona. He gave the commencement speech at Northwestern, his alma matter, a few years back. It’s uplifting and hilarious. We have to say goodbye to crazy Colbert, but we still keep Colbert entirely. Maybe this won’t be so bad.